The Black Star radio network of 13 Stations will also be heard via the new digital VAST satellite platform in May. Imparja Television, located in Alice Springs will provide the digital bandwidth for the service. Last Friday, QRAM manager Jim Remedio met with Imparja Chief Engineer John Wilkinson to finalise the engineering requirements for a seamless switchover via an ADSL line from Cairns QRAM studio to Imparja Alice Springs . 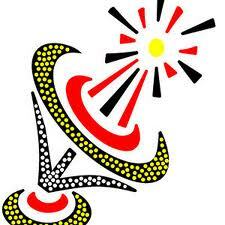 The new Black Star satellite service is one of many Indigenous remote media services which will connect to VAST before the end of 2013. The remote services form part of a uniquely Australian government commitment and approach to provide radio services to remote Australia. Imparja chief engineer John Wilkinson believes that we’re in an exciting era for indigenous broadcasting and with a national coverage of VAST available all over the country, even more exciting. We met up with an “old mate” from CAAMA, Gerry Lyons – aka G-Man, head of radio at CAAMA and also breakfast announcer. We were able to discuss program content and program sharing. CAAMA will work closely with QRAM to provide content including news, current affairs music festivals, and music content of first release material from CAAMA Music. For Black Star, VAST will provide a high quality 128k stereo service, adding to the existing Black Star Wide Area Broadband Network. In a two-way audio highway, we can give listeners the same high quality radio service as the capital cities. Broadcasters from any of the Black Star Stations have the ability and systems to send a program from their community to the whole of the Black Star network and have their content heard. The VAST Satellite Service comes into its own in times of festivals and cultural events in the region and be of interest to listeners both in the network and also outside it, as the VAST is open to everyone in Australia who has the means to receive it. General community radio services searching for content for their digital services, will have to option to expand what they offer their audiences, broadcasting events and music from regional and remote Australia. This will enhance their programming and work towards reconciliation through culture and music.